In the very beginning, God gave mankind dominion over this earth to rule, reign, and dominate it (Genesis 1:26). If you disapprove of the way things are at home, in your community, place of business or country, then you have a right to give voice to the Word of God and change that circumstance and start rearranging this earth. You do not have to settle for the way things are because the Lord watches over the righteous and His ears are open to your prayers. Once you recognize that your righteousness is of Christ and it is nothing that you have to work for, you will become a master over every work of the enemy. 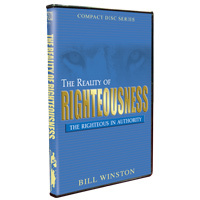 Order your copy of The Righteous in Authority today and learn how to walk in your authority because your Righteousness is in Christ!